The stages of grief you may experience before the actual death is known as ‘anticipatory grief’. Anticipatory grief is what happens when you know there will be a loss, but it has not yet occurred. Those of us who have had a terminally ill loved one, know all too well how devastating anticipatory grief can be. It impacts every part of your life with no closure. The closure will be death. You may grieve for a month, several months, a year, or more. The slow decline of a loved one is a heavy burden. It wears you down and the anticipatory grief gets harder with each passing day. You feel hopeless… helpless, even though you are doing everything possible to buy more good moments. All your efforts can feel so in vein as you constantly lose your grip. I thought I was just going crazy when I would find myself so overcome with grief, even though Niko was still alive. It could make it difficult to enjoy and cherish the time we did have left, no matter how hard I tried to focus on the positive. A friend printed out an article for me that she found called Strength for Caring – A Place for Caregivers. It was human focused, but it translates. You can find the full article HERE. Anticipatory grief is normal, but life is far from normal if you’re going through it. You may have bouts of crying, or be exhausted just from keeping yourself from crying. I personally, was not able to keep myself from crying. I had many wonderful moments with my sweet Niko, but I also cried so much knowing that we had very few left ahead of us. I slept very little, and I watched his every breath as he slept. I stroked his fur and wondered how he was feeling…. did he know the end was near? Symptoms of anticipatory grief are quite similar to those of grief after loss, including denial, mood swings, forgetfulness, disorganized and confused behavior, anger, depression, feeling disconnected and alone. You may have health symptoms, too, such as weight loss or gain, sleep problems, nervous behavior, and general fatigue. You may find few people understand that you are already suffering from the stages of grief. They don’t understand how you can feel this way when your loved one is still there with you. If you have not been a caregiver for an elderly or terminally ill loved one, you may not understand this type of grief at all. You may, in theory, ‘get it’ after learning more about it, but it is again one of those things you need to go through to fully grasp the magnitude. Because Niko was an older boy, and I had done so much for him throughout his life to get him to this ripe old age in such good shape, I didn’t feel as much anger as someone with a younger terminally ill loved one might feel. I am thankful for that. The worst part about anticipatory grief for me was worrying about the timing. I hated that I didn’t know when this horrible ride would end. On the flip side, you don’t want it to end, because that means death. That is another thing that you can only understand when you are walking this line. I learned that first hand. Death is not a ‘relief’ you are waiting for, despite how it may look to an outsider looking in. When Niko came out of remission, I knew we had very little time. My anticipatory grief shifted from complete anxiety to just sadness. While I still worried about making ‘the call’, I knew now it was close. Some people will say not to cry in front of your dog. Stay positive and happy around them, because they will sense when you are upset. That’s just it though, you cannot hide your true feelings from you dog. They know you like no one else, and put on a smile all you want, it won’t fool them. I cried every day in front of Niko. It was a release, and it never seemed to upset him. I felt better after wards, and we could enjoy our time. We had nice walks together and nice grooming sessions. He seemed at ease. That is what mattered to me. We had no secrets. Anticipatory Grief Symptoms: What’s the Big Deal? I wanted to say thank you for this. I have a young (just turned two a couple weeks ago) who is in kidney failure (was pre-diagnosed at 11 weeks/diagnosed at 7 months) and we just recently learned she has tumor cells in her urine. We know that time is getting closer and I’ve been struggling with how I feel about it. Wanting this trip to end because of the daily pain but not wanting it to end because I know how it has to end. It’s nice to read what it is I’m going through and for that, I wanted to send my thanks from me and my sweet Eva. Thank you for writing this. I’ve been so incredibly sad for so long and now I know I am not alone. My dog Fred, a 13 year old dachshund/beagle mix was diagnosed with diabletes in Dec 2009, Cushings in March 2010, complete blindness from Cataracts in May 2010, Cataract surgery in March 2010 and later Glaucoma in both eyes which has pretty much left him blind now. He only has a light response in one eye now. It’s been heartbreaking watching him deterioriate. Just when we seem to get a handle on one disease, something else creeps it’s ugly head.My husband & I are doing everything we can, but I cry daily because I fear the end, the unknown, and life without him. My husband tries to console me by telling me he’s still with us and that I shouldn’t be sad, but now I know what I am experiencing is not unusual. Thank you so much for taking the time to write about your experience. It’s exactly what I am going through and I had no idea it was a part of the grieving process. He was a beautiful dog and you gave him such a good life. Be happy with those memories! 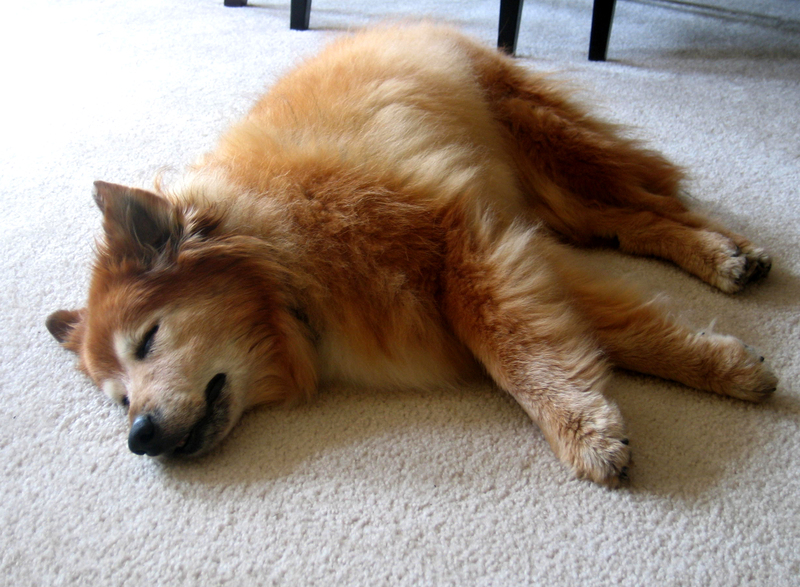 My dog Red, who lived 14 years, was so special to me. I remember friends telling me that “you’ll know when it’s time”, referring to putting her down. I really did know very quickly when she was no longer happy, and keeping her around would just be selfish. That was the hardest day of my life, watching my best friend go to sleep forever. Now, I just try to focus on all the great memories I had with Red. She brought such joy into my life! I’m very happy to see that you created a blog for Niko! Thank you for sharing your story and experiences. I said goodbye to my calico cat Heidi a week ago today. She was 21.5 years old – around 102 in human years. She had been ill with renal failure and hyperthyroidism for a while (years…? ), but only started medication for it in the last six months or so. I thought she was going several times before, and the anxiety and anticipatory grief was overwhelming. I went through hot and cold sweats, panic attacks, diarrhoea, nausea and not eating, and then she’d pull through and come good. She was as thin as a rake, drank loads of water, did such dilute and huge wees, vomited frequently due to GI issues after a bowel obstruction 9 years ago. But she struggled on, and we dealt with the constant messes, the fighting to get her pills down her throat… She was always cold, so I always had the heating and electric blanket on – power bills through the roof. She was my best friend, my confidante, my furbaby, my child. She went downhill really quickly – not longer able to squat to wee, so flooding the bathroom floor. She was wobbly on her hind legs, and losing her balance, and her eyes were a bit sunken. I had been absolutely dreading the day I would have to make the decision, and the night before, I cried until I ran out of tears. I couldn’t bear myself to cherish that final night together. But once I had made that awful decision, the relief was palpable. I could do it – make the decision for her benefit, not mine. I bawled whilst the magnificent vets at the RSPCA did their work, and left me with her for a while. But now I regret not taking any videos of her – I have wonderful photos of her all over the house, but no video or audio of her purr, or loud shouts – as she was totally dead in her old age. I didn’t keep a clipping of her fur – but her coat was so mangy and matted as she gave up on grooming herself a while ago, and the knots were too big to comb through. I regret not taking a paw print cast. I regret not writing a list of her nicknames – Butternut Pumpkin, Moo, Hudz, to name a few – and now I can’t remember them. But the strangest thing has been the “lack” of grief since she’s been gone…. The relief at no longer nursing her, medicating her, watching her every move for signs that it was “time”, cleaning up all her various messes… I never realised how much of my time and energy was spent on looking after her. I feel anxious that I am not grief stricken now. Is it still to come? Did I do all the grieving before she went? On the day, or on the other occasions when she was ill, or injured in a fight with another cat, and I thought it was the end for her then? I’m worried that I’m either denying myself my grief, or that I’m in delayed shock. I have read nearly every page on this blog, and I cried my eyes out – for you, and for everyone else you referred to, but a bit for me and Heidi too. She had an extremely long life, was loved and adored, spoiled and pandered to, and I miss her. I miss her smell, the sound of her bell on her collar, the way she used to get in under the covers in bed with me, and push her paws into my chest when she stretched. It was her nest, and I got used to having to sleep on my right side until she was comfy, and only then could I roll over. Now I have the whole bed to myself, and no longer have to cook with the electric blanket and heater on to keep her warm. It’s such an odd feeling, to miss her so much, but be “enjoying” all the things I can do now, which I couldn’t whilst she was here, I can go on a holiday for the first time in years… Anyway, it’s nearly 2am here in Australia, so I just wanted to thank you for your blog – it resonated enough for me to post online, which I never normally do. I hope Niko and Heidi are happy, pain-free and enjoying their life in whichever alternative dimension they’ve gone too.